I get so hell bent on cooking outside my capabilities while overlooking the simplest of preparations. Like most aspirational home cooks, I pour over recipes that are more than a little ambitious though I rarely take a shot at them. As I fret over how to find time to cook a dish that will require days to piece together, the quick no-hassle possibilities remain ignored. This roasted pear and red onion side is a perfect example of the later but it tastes as though an expert worked some sort of kitchen magic to produce a dish so obviously delicious. Of course, an expert at Martha Stewart living did, in fact, conceive the recipe for this gem of a technique that includes nothing more than cutting pears that have been cored and red onions into wedges, laying them out on a baking sheet, drizzling them with olive oil and sprinkling them with sea salt then setting them to roast on the center rack of an oven set at 425 degrees until golden. 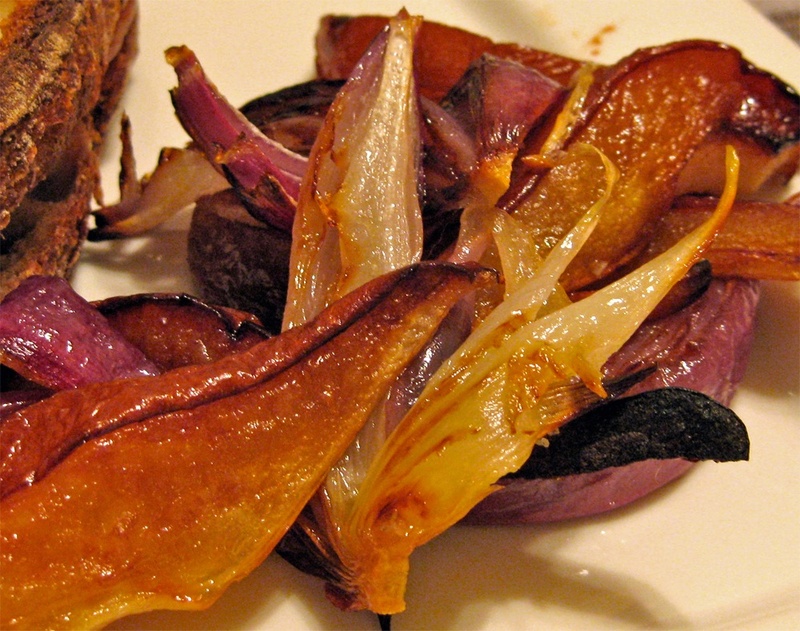 To guild the lily, you can also add a bit of bleu or goat cheese to the roasted pears and onions. It only takes 30 – 40 minutes to get there while you prepare whatever else it is you intend to serve along side them.